Pink Gem Engagement Rings You MUST Peek At! 10 Pink Gem Engagement Rings You MUST Peek At! From pink diamonds and pink sapphires to blushing morganite and cherry-color rubellite, there are many new non-traditional engagement rings for women who like to show their uniqueness. Have a look--one of these pink dazzlers just may be the ring of your dreams. Loving this Alishan engagement ring in a two-tone metal setting with a round pink sapphire set in 18K rose gold. Mad About Morganite . 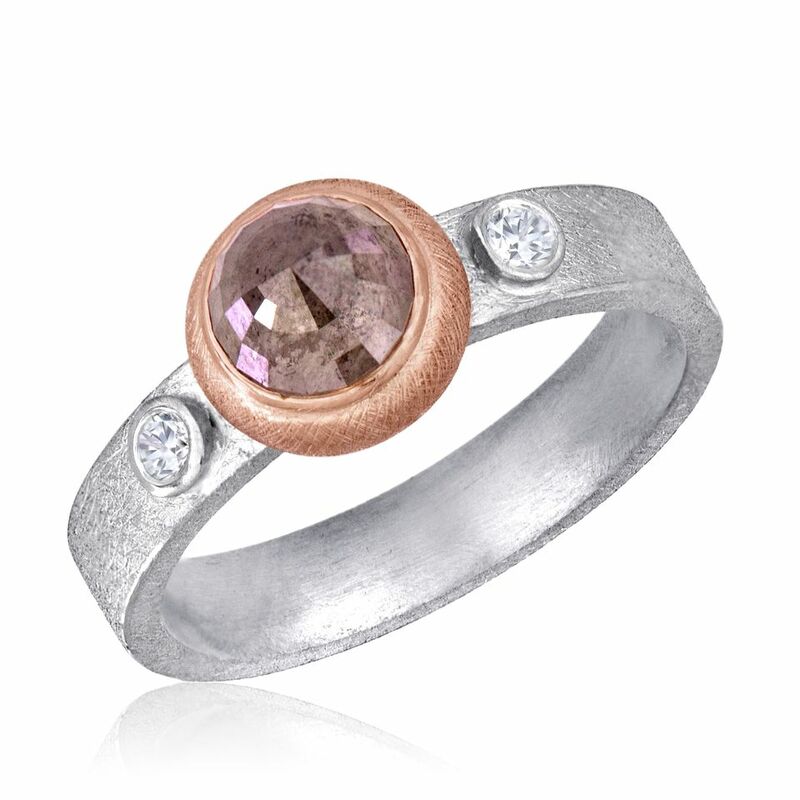 . .
Pamela Froman Fine Jewelry 18K white gold engagement ring with morganite and diamonds. This ultra-feminine ring from Pamela Froman Fine Jewelry is perfect for a woman who prefers subtle color--and, yet, something unique. It's called the "Double Arabesque," as it has undulating swirls of precious metal. And, set within the design is a natural pale pink pear-shaped morganite. As a finishing touch, a halo of diamond pave (0.08 tcw) surrounds the cake-frost-color fancy cut! Checkerboard-Cut Pink Sapphire Cushion . . .
Takohl Design Treasure Ring engagement ring with pink sapphire and diamonds. Can you get more personal than this! This is a Takohl Treasure Ring from Takohl Design. Created by chicago designer, Tammy Kohl, who patented the signature open/close mechanism, your engagement ring will, certainly, become a timeless, heirloom quality piece. The stone--for example, this pink sapphire--is chosen by the bride-to-be (or her fiance, of course) and set in a precious metal band, that opens up to reveal whatever personal message the couple wants. It ensures that your betrothal ring expresses the sentiment you desire to convey. Price options for different gems and metals are listed on the Takohl Design website. Really Precious in Pink Sapphire . . .
Jack Abraham, The Precious Collection, pink sapphire and diamond engagement ring. A 10.53-carat pink sapphire is the focus of this engaging engagement ring from Jack Abraham, The Precious Collection. Although, the two half-moon diamond side stones are also pretty spectacular. An Octagonal Pink Moonstone . . . .
Ivanka Trump Collection 18K gold ring with morganite and diamonds. I think this sleek, stream lined beauty from the Ivanka Trump Collection is a great choice for modern career women especially. From the "Patras Collection," it highlights a pretty-in-pink octagonal rainbow moonstone that's surrounded by a halo of diamonds (0.52 tcw. ).It's in 18K yellow gold. If you log onto their company website, you can pre-order it. Halo Is Perfect for Pink Tourmaline . . .
Brooke Gregson 18K rose gold ring with pink tourmaline and diamonds. You won't find anyone else wearing this engagement ring. L.A.-born designer, Brooke Gregson, who works out of her London shop, hand-selects all the gemstones she uses in her designs. This Brooke Gregson ring, in 18K brushed rose gold, features a 5-carat hexagonal-shape pink tourmaline that's Georgian-set. Just take note that, with this design, the exact stone color and shape may vary slightly from what you see here, as each gem is unique. A Dazzling Design In Pink Diamond . . . If this Gem Platinum combination engagement ring/wedding band is the kind of style you think you're looking for, you may want to go to the brand's website, as they have an amazing line called the "Jeffrey Daniels Unique Designs." Rings are pricey, though--prices are listered there--but the regular Gem Platinum collection of bridal rings is also gorgeous--and, for the most part, less expensive. Pink Tourmaline and Texture . . .
Jane Bohan 18K gold engagement ring with pink tourmaline; matching wedding band with diamonds. Jane Bohan's 18K yellow gold engagement ring and matching wedding band have the alligator texture, which is one of this designer's signature metal finishes. On this engagement ring, a round pink tourmaline is bezel set; on bridal band, the diamonds are also in bezels, nicely echoing the setting of the engagement ring. Puttin' on the Pink Sapphire . . .
Alishan engagement ring with round pink sapphire set in 18K rose gold bezel. Quite an original, yes? From Alishan, this engagement ring in palladium spotlights a round pink tourmaline center stone that's bezel-set in 18K rose gold. Two round colorless diamonds--one on each side--are also bezel set, creating an overall contemporary look. A Cool Morganite Cushion Cut . . .
Greenwich Jewelers engagement ring with morganite and diamonds. This artsy jewelry shop, Greenwich Jewelers, in downtown New York City, carries so many unique engagement rings--as well as custom ones--that, looking at their website will definitely inspire you to think out-of-the-box when choosing your betrothal ring. (Lots of wedding bands for men, too,) Here, the design features a morganite with a diamond halo that extends around the shank. I suggest taking a look at their site before giving them a call.